Texas is set to execute Terry Edwards. That would be an irrevocable miscarriage of justice. Is Texas About to Execute an Innocent Man? Terry Edwards’ murder conviction is irrevocably flawed. Police officers gather to remove activists during an anti–death penalty protest in front of the U.S. Supreme Court on Jan. 17, 2017, in Washington. Unless the courts or Gov. Greg Abbott step in to stop it, Texas will execute Terry Edwards on Thursday. This would be a reprehensible miscarriage of justice. Edwards’ conviction for capital murder was won at least in part due to a faulty forensic argument pushed by the prosecution and what appears to be a racially biased and likely unconstitutional jury-selection process. 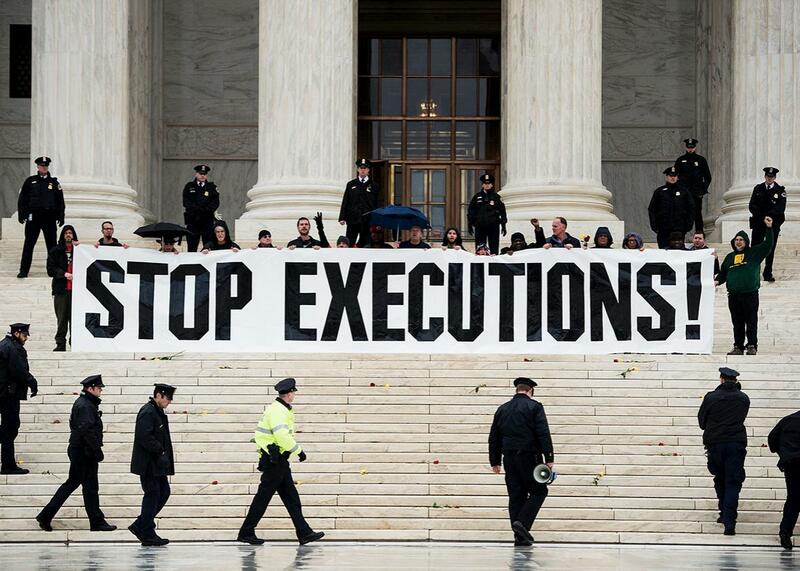 If this execution proceeds as planned, it would be an irrevocable stain on a state justice system that leads the nation in wrongful convictions. Terry Edwards is not a saint. He and his cousin Kirk Edwards were responsible for the 2002 homicides of Tommy Walker and Mickell Goodwin. But while Terry Edwards took part in the burglary that led to the murder of two of his former co-workers at a Subway restaurant in the Dallas suburbs, it’s less clear that he was the triggerman. In a series of filings earlier this month, Edwards’ attorneys requested that his execution be stayed and a new writ of habeas corpus be considered. It will be up to the 5th Circuit Court of Appeals to decide whether new evidence ought to be considered at the federal level, while the Texas Court of Criminal Appeals is also considering whether to stay the execution. The appeal makes for damning reading, dismantling key portions of the case against Terry Edwards. The principal evidentiary problem with Edwards’ case surrounds the use of forensic testimony about gunshot residue. Despite the shooting having occurred at point-blank range, Edwards had no blood on his body, no gunshot residue on his hands, and none of the victim’s DNA on his person when he was picked up by police immediately after the crime occurred. He was tested for gunshot residue within an hour of his arrest, according to the appeal. A state forensic analyst named Vicki Hall tested Edwards’ hands for gunshot residue and found it wasn’t there. Given that negative result, the defense called Hall to testify at Edwards’ trial; she was the defense’s only witness during the guilt-innocence phase. On cross-examination, though, Hall explained away her test results, testifying that Edwards might have either sweated away or wiped off “some of that residue.” Hall had also indicated in her forensics report that one of the three elements that would have been found in the gunshot residue was present on Edwards. In closing arguments, prosecutor Thomas D’Amore used Hall’s testimony to argue that the presence of that one element—the relatively commonplace barium—proved that gunshot residue had been present, and that Edwards had somehow wiped off the other two chemicals. The three chemicals, barium, antimony, and lead, exist in the same particle, or in particles that contain two of the three. If you remove any of the components they would be removed linearly. It does not occur that just one of the components is removed; the components all increase or decrease together. It is not possible that a defendant who had gunshot residue on his hands could simply wipe two of the three components off of his hands and not the third. According to Mills, there is reason to believe gunshot residue would have been present on the shooter in the immediate aftermath of the attack. Hall, the forensic analyst, ran a trace analysis of the victim Mickell Goodwin and found all three elements on her right hand near a defensive wound. That result is “important for two reasons,” Mills told me. “It does demonstrate that the gun that was used does emit a relatively high volume of gunshot residue when fired, and it heightens the significance of the absence of gunshot residue on Mr. Edwards.” Hall and the state, however, failed to disclose this test to Edwards’ lawyers in advance of the trial, and his new legal team didn’t uncover this fact until very recently. At trial, though, Hall did testify about the negative results from tests conducted on the hands of the other victim, Tommy Walker. While Terry Edwards was seen dumping the .38-caliber handgun used in the murders in a trash can across the street from the restaurant, the appeal argues that the “state withheld evidence from an undisclosed eyewitness to the offense” that might have indicated that Kirk Edwards had been more involved in the robbery than prosecutors led jurors to believe. The only potential witness to the crime, according to a police report, saw a man fitting Kirk’s description “running from” the restaurant, which would contradict his claim that he was merely the getaway driver. Inexplicably, this witness was not called at trial. The most damning portion of the appeal, though, has to do with jury selection. Back in May, the Supreme Court ruled 7-1 in the case Foster v. Chatman that Georgia prosecutors had used a blatantly unconstitutional practice to pick the jury in a murder trial. Prosecutors in that case had written a B next to the name of every black juror, then used peremptory challenges—which attorneys can use to strike jurors without explaining why—to remove some of those black men and women from the pool and select an all-white jury, which ultimately convicted a black defendant of murder. The court found that these actions violated the Equal Protection Clause of the 14th Amendment. Nearly all of the jury information in the Terry Edwards case—including the vast majority of jury questionnaires—has gone missing. But Edwards’ defense team did find a “strike list apparently maintained” by prosecutors that includes “a handwritten, encircled ‘B’ ” next to 32 of the jurors’ names. “When we saw it, Foster vs. Chatman had just come down and we couldn’t believe the similarity,” Mills told me. According to the limited information the appellate team has in its possession, at least 30 black people were struck from the jury, which was ultimately all white with a single Hispanic alternate. Two of these potential black jurors were struck for cause, while the other 28 were removed thanks to an agreement made by the defense team and prosecution as part of a jury-strike bartering system used in Texas at the time. In this case, it seems possible that this trade allowed the prosecution to get rid of all of the black jurors without having to use peremptory challenges. (What the defense attorneys got out of this exchange is anyone’s guess.) If it can be proved that the “B” in the marking means black, the courts would likely have to clarify whether this scheme was as unconstitutional as the peremptory-challenge one. “Foster v. Chatman could greatly bolster the defendant’s [unconstitutional jury selection] claim, provided there is some indication that ‘B’ signifies ‘black,’ ” Daniel S. Medwed, a professor at Northeastern University School of Law who focuses on wrongful convictions, told me. Edwards’ attorneys believe that if the latest stay request is granted, they might be able to find those missing questionnaires or track down the jurors to determine whether or not “B” meant black. Whether or not Terry Edwards is guilty or innocent of pulling the trigger in those 2002 homicides, it would be criminal to deny Edwards’ attorneys the time to investigate this basic constitutional question. If Edwards doesn’t get that stay, he’ll be executed by the state of Texas on Thursday. There would be no rectifying that injustice.